It's a warm, summer June 10 day on the campus of Hampton University. Parking lots are filled and eager faces fill the lawns of Holland Hall. When you enter Holland, you can't miss the bazaar filled with church supplies and apparel. 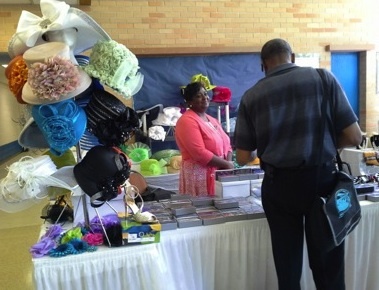 Visitors are seen gathering around vendors picking up stylish church hats in nearly every pastel color, perfumes and oils, cufflinks, church fans and CDs. "These vendors carry everything ... it's a one stop shop," said the Rev. Bonita Nsah of Salisbury, Md. Aside from the bazaar, the conference offers a series of workshops and evocative messages from notable pastors. The Hampton University Ministers Conference has thrived for 101 years. After celebrating its Centennial Commemoration last June, the conference has returned yet again, and this time welcomed over 6,000 spiritual leaders and churchgoers. The much-anticipated event was not new to many visitors; many attendees return year after year for a meaningful worship experience on all accounts. Hampton University Chaplain Rev. Debra Haggins said, "Visitors really love the campus. It's always a hit." Today, in many churches across the country, said conferees who were interviewed, congregations have become divided, and many older churchgoers have a much different take on the worship experience. May F. Slater, a Missionary Baptist, from Charlottesville, Va., considers herself an old-time Baptist and recalled church being a major part of her upbringing. "I grew up the traditional way," said Slater. "You went to church dressed up and you had a pair of church shoes just for Sunday." Slater also said that a lot of the music being played in churches today isn't as meaningful as the hymns she treasures, but instead sounds much like "bedroom music." Although, the church is responsible for many sacred traditions, many leaders and ministers, said conferees, have chosen to reinvent their once traditional church and adopt contemporary customs in order to keep their church afloat and draw more people. New-age churchgoers are interested in contemporary worship styles, and retire the old, wearing your "Sunday Best" adage. After all, "Clothes can't get you into heaven," said Rev. Johnnie Brown of Gethsemane Baptist Church in Newport News, Va.
Then on the other hand, some feel churchgoers were neglecting their ancestry as trends of contemporary churches emerge. For generations, churches have been considered a cornerstone for Black America and some conferees argued that churches and spiritual leaders are responsible for a vast majority of social, economic and political changes that have been made in the black community. Africans were given the Christian Bible; while they were enslaved and during their time of oppression, they found comfort in their readings and used faith as a tool to sustain themselves. Elder Ethel Walker of Albany, N.Y., said, "Carrying on the tradition of dressing up for church is in our heritage, and we need to continue to present ourselves in God's best." Most contemporary churches of today are much like this, said some conferees: fewer men in suits and ties, worship leaders ministering in jeans and sneakers, large screens mounted around the sanctuary projecting words to scriptures and songs, hardly any ladies in their big vibrant church hats, people referring to scriptures on their smart-phones instead of opening their bibles and traditional hymns hardly being sung. Rev. Pamela Jones of Brooklyn, N.Y. said, "The church is like a living organism – it changes, we can't be stuck in what grandma used to do." Despite the differences of traditional and contemporary church-goers, most agreed that the true mission of the church was to do the will of God. Melech Thomas, an assistant pastor from Washington D.C said, "A lot of people are growing up unchurched – it is important not to lose people because we want them to conform to our way of doing things." Freddie Curry, an associate pastor from La Plata, Md., said, "Accept the change, and as long as you dress respectfully, it doesn't make a difference."